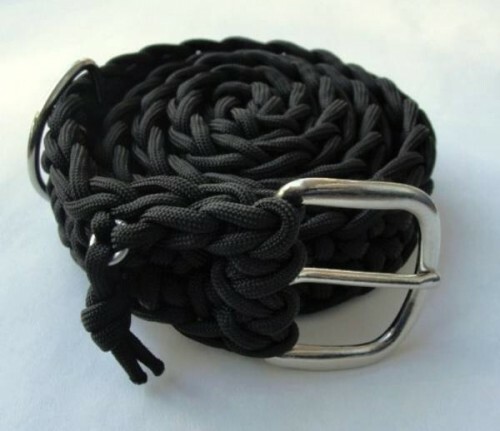 Paracord Is Survival Cord Disguised As Belt | OhGizmo! You never know when the need might come to rappel down a building. So it might make sense to go around holding your pants up with carefully braided 550 paracord. When that moment comes, simply take the belt off, pull the tab and you have 80+ feet of cord at your disposal. You might look a little stupid going down a building in your underwear but if things get to that point, we suspect that’ll be the least of your worries. We’re also not sure just how hard it’ll be to braid it back into its former belt shape once you’ve deployed. Rappel down a building? Oh yeah, because I find myself in that pickle regularly. LOL! Neat idea, but like previous poster pointed out, unless you hang out on building tops on a regular basis seems like it would be nothing more than a conversation piece. Conversation piece and fashion statement. Ok, a big maybe on the latter of the two. Seems like a Bear Gryll poorly thought out gimmick. Long before you have a need for it the part that passes around the buckle is going to get worn out from the buckle rubbing against it. At best you’re going to end up with several pieces that are 2X the length of the circumference of your waist.